There are three major types of gas furnace. These are 1. single stage furnace. 2. Two stage furnace. 3. Modulating furnace. The simplest of these and least expensive is the single stage furnace. This appliance also has the lowest AFUE rating and is usually 80% to 82% efficient. This is known as a medium efficiency furnace and is very commonly used in areas where winters are relatively mild and short. The two stage furnace and the modulating furnace are more complex in construction and as a result cost more. They have efficiency ratings of 90% up to 98% and use the least fuel to warm your home. The high efficiency furnaces with their high AFUEs will save you the most on fuel costs. The other thing that must be considered however is the much higher initial cost. Will the extra investment be paid back in a reasonable time by the savings in your fuel bills? Who cares about furnaces? As long as they stay quiet, remain out of the way, and do their job, most homeowners give them little thought. Until it's December 21st and the furnace has taken its last breath and all the heating/cooling companies seem to be shut tight for the holidays. Then, your furnace gets an awful lot of thought. Acquaint yourself with three major types of gas furnaces before the salesperson rolls up to your door. We have arranged the furnace types in order of efficiency (AFUE*) and cost, least efficient and lowest cost leading the way. First, let's briefly discuss furnace efficiency. The Annual Fuel Utilization Efficiency (AFUE) measures the amount of fuel converted to space heat in proportion to the amount of fuel entering the furnace. This is commonly expressed as a percentage. You've probably lived in a house with a single stage furnace. The gas flame is either on or off. Consequently, the furnace waits for the temperature in the house to get cold--often colder than comfortable--before firing on. Then, the furnace rams the house full of heat until the thermostat shuts the system down. You're left with a lot of heat build-up, which is great if you're a "cold-blooded" person but bad for your energy bills. For a target of 72 degrees, actual temperatures in your house might range as low as 68 degrees and as high as 76 degrees. Single stage furnaces are the most wasteful in terms of energy, but they are the lowest cost to purchase. The two-stage furnace is a little smarter than the single stage furnace. Rather than a simple on/off operation, its flame can be on/high, on/low, or off. Adding this second flame setting makes a dramatic difference in energy costs. Two stage furnaces are much quieter than single stage furnaces and slightly higher cost. For a target of 72 degrees, actual temperatures in your house might range as low as 70 degrees and as high as 74 degrees. This furnace adjusts its flame incrementally so that the true temperature never varies more than 1 or 2 degrees from the thermostat's target temperature. In terms of comfort, it's the most comfortable gas furnace you can buy because you avoid those long, cold periods (found in single and two stage furnaces) and high build-ups of heat when the furnace eventually responds. In addition to a variable flame, the blower is variable according to demand. For a target of 72 degrees, actual temperatures in your house might range as low as 71 degrees and as high as 73 degrees. Modulating gas furnaces are among the most energy efficient furnaces and are rated at 98% efficiency. These are also the highest cost furnaces. 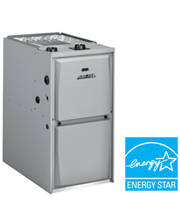 AFUE, or Annual Fuel Utilization Efficiency, according to EnergyStar, "measures the amount of fuel converted to space heat in proportion to the amount of fuel entering the furnace. This is commonly expressed as a percentage." What are the downfalls of the three furnaces? I saw that you explained the good points of the top three, but what is the catch as far as quality? I am looking to buying energy efficient furnaces for my condominiums and I want to be able to offer them as an added feature to the condos.